Hans Bothe discusses how training benefits employee performance and retention on Aurora Organic Dairy. Employee turnover is top of mind for many farmers as labor continues to be a hot topic in the dairy industry. Bonuses, higher wages, and paid time off are some of the strategies that farmers are using to improve employee retention on their farms. For Aurora Organic Dairy, investment in training and educational resources is another. We called on Hans Bothe, director of herd health, to get his take on the impact that training has had on their farms. His insight, specifically surrounding the People and Parlors milk quality training manual, had some unexpected benefits for milkers and managers alike. Q: What is your role at Aurora Organic Dairy? A: As the director of herd health I am dedicated to training and overseeing protocol compliances. I also work with our internship program, provide calf raising support, and supervise data analysis. I have a really good team behind me that help me a lot with all of these activities, and they are the ones that make everything happen. Q: How many parlors do you have? How many cows do you have milking? How many employees? A: We have 10 total parlors, with about 20,000 head milking. Across the plant and farms, we have roughly 600 employees. Q: What is your philosophy for employee training? Do you offer different training “courses” depending on position? A: We designed some modules that cover calves, fresh cows, both the cow and calf sides of maternity, and necropsies. Nobody performs dehorning, hoof trimming, or euthanasia without certification. We also certify milkers — that’s where the (People and Parlors) manual comes in. Q: What caught your eye with the People and Parlors book? Was there a challenge you were hoping it would solve? A: Every year around August/September, we certify our milkers by performing a practical and theoretical test. From that test we score all of our milkers, and if they pass we give them an Aurora Dairy Milking Certificate. This year, we decided to give People and Parlors as a reward. The response was overwhelming. Our milkers were very excited to receive the book. Q: How have your farms implemented the People and Parlors manual with your on-the-farm training process? A: Our milkers really appreciated having the Spanish and the English side-by-side. Starting this year, we are giving the manual, certificate, and a bonus for each new employee that passes their 90-day probationary period. Having this process in place is a really good welcome for everybody. Training everyone for the annual certification at the same time is time consuming. So now, we just take a little bit of time for each new employee versus doing it all at once. Q: Have you had any noticeable improvements in job performance after introducing this process? A: I would say that the biggest impact is from the interaction with the supervisor and being able to get in tune with the program, and with the system. Being able to perform well goes right along with that process. Bothe acknowledged that providing the “why” behind the “how” is the idea behind each of their modules, but that it’s a learning process for everyone. Not just the employees. People and Parlors helped explain the “why” and “how” behind milk quality in a way that both milkers and managers could understand and put into their daily practice. Along with extending the proverbial “welcome mat” to each new employee, certification brings a sense of accomplishment and being part of a team. 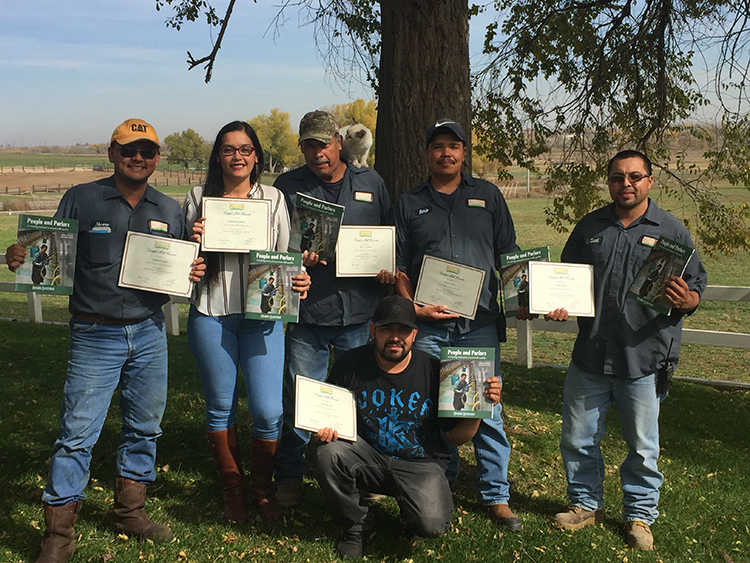 While every farm may not have the resources to create their own certification program like Aurora Organic Dairy, it might be worthwhile to look into ways to tweak your training process that will drive employee engagement and long-term success. Interested in learning more about the People and Parlors milk quality training manual? View a preview at hoards.com/bookstore/PEPA. The author is the special publications manager. Aisha is a graduate of University of Wisconsin – Madison with degrees in Life Sciences Communication and Environmental Science. She is responsible for the Hoard’s Dairyman bookstore and creating educational resources for farmers, students, and dairy industry professionals..